This is my most recent book. to learn more. Available as an instant download ebook. popular book. Now available as an instant download ebook! An "awakening" is a moment of clarity in which a new insight or understanding is gained. With this new awareness the experience of life is seen differently, and new possibilities are opened. Changes in patterns of thought, emotions, and behavior occur. An awakening allows the possibility of growth to new levels of psychological and spiritual maturity. The picture above represents such an awakening. It was taken on a day that started sunny but soon turned to rain. During the bus ride from Salisbury to Stonehenge there was a downpour. I grumbled to myself and my wife about how the rain would ruin this long awaited trip. 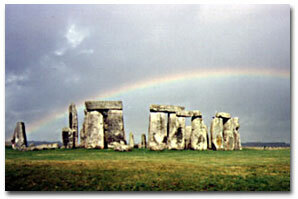 As I walked around Stonehenge in the cold and wet mist, I was still disappointed with the day. Suddenly, the rain stopped and the sun momentarily broke through the clouds. For a few brief minutes the rainbow appeared. This rainy day and, especially, this moment became the highlight of my two week trip to England. It also opened me to a new attitude. Without the rain I would not have found that rainbow. Grumbling about your present reality does not help. You must be open to every moment. You never know what it will bring. The Cycle of Change and the predictable process it follows. The Enneagram: Finding the "Hidden Self." The Labyrinth - Walking a spiritual path. Labyrinth Stereogram: Can you find the hidden 3D labyrinth? Lessons for Living - Lectures on life. Midlife Metamorphosis: How midlife is taking you towards wholeness. Mind Storms: Don't get blown away. Sidewalk of Life. Watch out for the holes. Stereograms - Pictures that teach. Stress and how to "undo" what it does to you. "Wheel of Life 1": The emotions of change. "Wheel of Life 2": The spiritual journey to your center. Take an Online Stress, Burnout, or Depression Test. See how you are doing! Click Here for the "Stress Cat"
Listen to a "Relaxation Exercise" sound file. Your feedback on these pages is welcome.